The top decision makers and thought leaders in Renewable Energy in the MENAT region. Dii have named Jamie, one of our Glasgow based Managing Consultants, as one of the top 250 decision makers and thought leaders who are shaping the Renewable Energy sector in the MENAT (Middle East, North Africa & Turkey) region. We are very proud to have one of our team on this list, amongst some real movers and shakers. 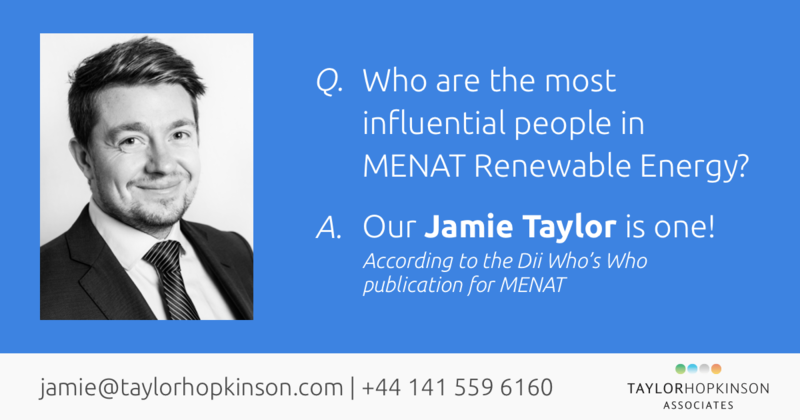 We all knew here that Jamie is a big deal, but it’s nice that others have recognised it too, and are sharing with others all the great work he has done in placing people in jobs and projects within the ever growing MENAT Renewable Energy sector. Below we have a small interview conducted between Dii and Jamie in which, amongst other things, Jamie highlights the need for Recruiters in the MENAT region to help facilitate the skill gap that is present. The Who’s Who in MENAT Renewables is a publication produced by Dii – Desert Energy, a not-for-profit organisation based in Germany which explores the potential and possible improvements for market conditions for renewables in the desert areas of the Northern Africa and the Middle East. Jamie leads THA’s solar activity across international markets with a particular focus on the Europe, Middle East and Africa Region (EMEA). Current efforts are focused around the ever-growing solar market in MENA, where he is working closely with the leading local and international companies. Where do you see most potential in MENAT in the near future? There are so many interesting markets within this region, but we are currently seeing a lot of activity in Egypt, and a number of key players interested in this market. Saudi Arabia will undoubtedly be a key market due to significant renewable energy targets, and the UAE is the epicentre of this region where the bulk of our MENA clients are based, with the majority of our recruitment efforts being carried out here. What is the biggest challenge for renewables in MENAT? Whilst there are many challenges for the industry within this region, one which is particularly important to address is the skills gap that exists locally, i.e. although there are transferable skills, there is not the level of experience and knowledge that exists in more mature markets such as Europe and North America. Therefore, companies like THA are necessary to facilitate the sourcing and onboarding of required talent to address these shortages. If you would like to contact our mover and shaker, Jamie, please get in contact with him via email – jamie[@]taylorhopkinson.com or drop us a line at +44 (0) 141 559 6160.